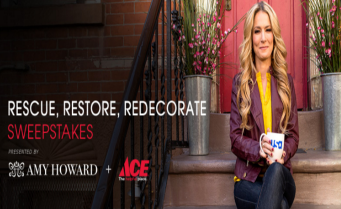 USA Network Rescue Restore Redecorate Sweepstakes – Win $5,000 in Ace Hardware gift cards! Win $5,000 in Ace Hardware gift cards! ENTER SWEEPSTAKES HERE – USA Network Sweepstakes page. ENTRY LIMIT – You may enter once per day during the Sweepstakes Period. ELIGIBILITY – Open only to permanent, legal United States (“U.S.”) residents who are physically residing in one (1) of the fifty (50) United States or the District of Columbia (excluding Puerto Rico, Guam, the U.S. Virgin Islands and other U.S. territories) and who are eighteen (18) years of age or older and of the age of majority in their state of residence as of the start of the Sweepstakes Period. SWEEPSTAKES ENTRY PERIOD – The Rescue Restore Redecorate Sweepstakes will begin on April 1, 2016, at 12:01 a.m. ET and end on April 29, 2016, at 11:59:59 p.m. ET. PRIZES – There will be one (1) grand prize (“Grand Prize”) awarded to the Grand Prize Winner. Grand Prize consists of five thousand dollars ($5,000) in Ace Hardware gift cards, which will be awarded in the form of twenty (20) $250 Ace Hardware gift cards. Estimated Retail Value (“ERV”) of Grand Prize is five thousand dollars ($5,000). There will be ten (10) first prizes awarded, one (1) to each First Prize Winner. First Prize will consist of one (1) Ace Hardware gift card for one hundred dollars ($100). ERV of each First Prize is one hundred dollars ($100).